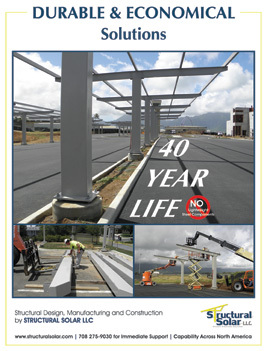 Structural Solar LLC is a leading design-build company who specializes in economical solar carports and specialty solar structures for institutional, municipal and commercial solar installations. The highly durable and low cost structures require equally cost effective foundation design and installation. Structural Solar designs and installs a wide range of foundations for its structures, including, drilled pier foundations, spread footers, helical, screw and driven steel piles. Structural Solar’s design team can quickly evaluate all foundation options to determine the lowest cost and most effective methods for virtually any solar project. Additionally the company has the equipment and operational expertise to fully install the foundations. Structural Solar designs and provides signed and sealed drawings for foundations and structures for project across North America and can accommodate a wide range of project sizes. For more information about Structural Solar’s foundation design capability, consult the company’s website or call Bob Pegnato at 708 275-9030.